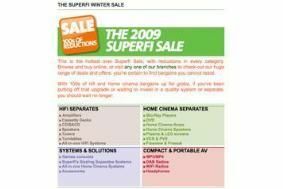 Superfi winter sale starts today! | What Hi-Fi? Superfi winter sale starts today! There's a wide choice of discounted Blu-ray players to choose from, including the Award-winning Sony BDP-S360 for £119.95 with three Blu-ray discs and multiregion DVD playback. And if you want a Blu-ray recorder, Panasonic's DMR-BS750 with 250GB hard drive and twin Freesat tuners is available for £649.95. Need surround sound? Yamaha's RX-V1065 multichannel receiver is yours for £499.95, or you can have the Onkyo TX-SR607 for £349. There are plenty of surround speaker packages on offer too, including KEF's KHT2005.3 system with Kube2 subwoofer for £499.95 (silver only) and the Acoustic Energy Aego T 5.1 pack for the same price. Looking for a TV bargain? Check out Superfi's special offers on Samsung LCD TVs, some of which come with a free Samsung BDP-1600 Blu-ray player. Hi-fi lovers aren't short of a deal either, with a stereo pair of Q Acoustics 1030i floorstanding speakers on sale for £139.95, or the Epos M5i at £274.95. And the NAD C545BEE CD player, one of our long-standing favourites, is available for £269.95, saving you £80. If you'd like a stereo amp to go with it, how about the NAD C326BEE for £249.95, normal price £325. Want an all-in-one stereo micro system? Then check out Yamaha's M-330 CD/DAB/iPod system for just £179.95, saving you £120. For these and many more savings, head on over to the Superfi website.